Get ready to make the most of these last lazy days of summer with not just one but two delicious no-bake dessert recipes! If you like a bit of spice with your sweet flavors, you’re going to love these! This is of the best summers in Montreal! The weather was (and still is) gorgeous with few showers and lots of sunshine! To soak up that sun, I try to go out into our community pool whenever I can. I am hooked on my weather app and plan my days accordingly. On those gorgeous days, I wake up early and work from 5 am to 1 pm. Then I enjoy the pool with the kids. Our winters are so cold that I need those days to keep me going through those frigid months. The downside is that I don’t get much cooking done, let it alone baking! I fired up my oven maybe twice since the beginning of the summer. What do I do? I use my BBQ to the fullest and try to come up with no-bake recipes and desserts! Even, if I had time to bake a rich dessert, it is so hot that I don’t feel like doing it or eating a heavy cake anyway! I need something refreshing! There’s nothing like fresh fruits from my farmer’s market to help me achieve that. Today, I am sharing 2 delicious no-bake desserts that even your pickiest eater will ask for more. They can even make them for you (don’ we love to get spoiled by our kids?). Curious? 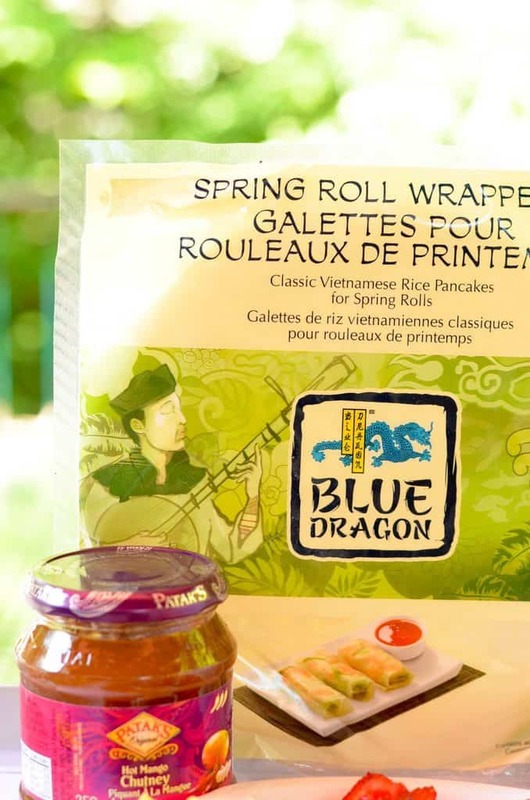 Read on and see how you can make delicious fruit spring rolls and yogurt bowl with Blue Dragon and Patak’s Canada products! Some ingredients are a staple in our home. 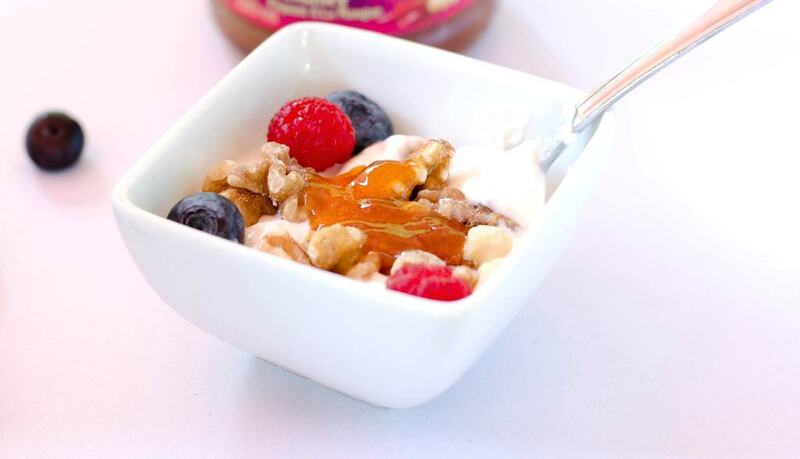 Aside from the eggs, milk, and flour, we always keep things like fruits, nuts, and Greek Yogurt on hand! I can think of endless ways to eat these but one of my favourite is a bowl of yogurt topped with nuts and fruits! It’s my favorite no-bake dessert. It is also a great snack, breakfast! I can eat it anytime of the day! When I was challenged to make a spicy dessert as part of my ambassador program with Blue Dragon and Patak’s Canada, I decided to add a spin on my favorite and easy desserts! Your favourite fresh fruits of the season. I used peaches, strawberries, blueberries and raspberries. Your favourite nuts. I used walnuts. Note: I did not add quantities on purpose because it depends on the number of people, your taste and whether you want more fruits than nuts. Add fruits and nuts to taste. Top with 1 tsp of Hot Mango Chutney. And oh my! The Mango Chutney added a wonderful kick to my fruit bowl. Plain Greek Yogurt is really PLAIN and the fruits of the season can be a little sour. But adding Hot Mango Chutney compensated for that and big time! It was a wonderful taste for the palate and crunchy too! Bonus, it is ready in just a few minutes and everyone can mix and match whatever they like. My daughter loves blueberries but is not a fan of raspberries, so she made a bowl with raspberries, nuts and a touch of Hot Mango Chutney. 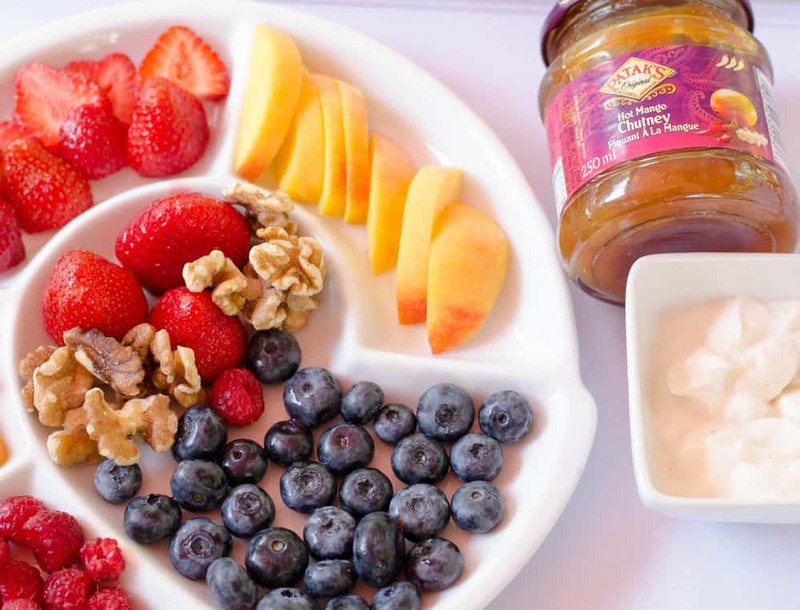 I, on the other hand, love all the fruits so I added them all with a delicious spoonful of Mango Chutney. Don’t you love mixing a Little India in your desserts? This is another wonderful no bake dessert and fun to make too. Prepare the spring roll wrappers per directions. Fill them with fruits and nuts. I filled one wrapper with blueberries and strawberries. I filled another one with peaches and blueberries. 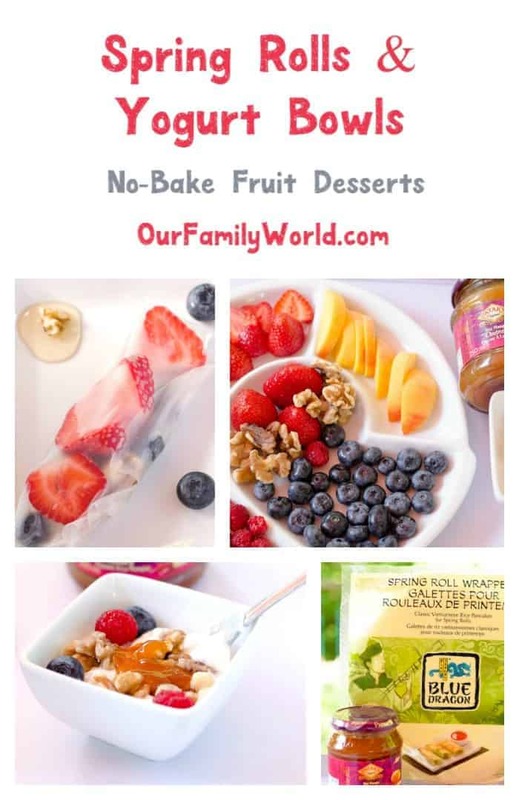 The mix of fruits and nuts will add a delicious crunch to your wrappers! You can even dip them in a coconut cream like I did last year for these mango kiwi spring rolls. East is made easy with this recipe. Check out Pataks Canada and Blue Dragon Canada for more great ways to spice up desserts! Follow Pataks on Facebook, Blue Dragon Facebook, Pataks Twitter, and Blue Dragon Twitter to keep up with all their exciting news! I am part of The Cultured Kitchen Ambassador program in partnership with Blue Dragon Canada and Patak’s Canada and I receive special perks as part of my affiliation with this group. The opinions on this blog are my own. These look so good. I love that they are something that I can make and enjoy without baking. Nice, that ended in a delicious mixture. This should really go well with any audience, even for kids! The no-bake part also got me very enticed. Yum! This looks fast and delicious which is a perfect combo to me. These are adorable and look like a fun treat. Hot Mango Chutney sounds so good! I need to try this! That would be a great after school snack. My kids are always starving when they get home. These look yummy! And such a great way to satisfy a sweet tooth without all the harmful sweets. I’ve never tried a spring roll before. But, I just love yogurt bowls! This is such a great idea. I think I am going to try these for my childrens’ lunch come BTS! Ive had a spring roll before but not a Fruit Spring Roll! Wow looks delicious I would love to recreate this! I’ve actually been meaning to try to make both of these because they look so darn good! These look like they’re delicious dessert wise and I love how they’re a HEALTHY dessert to boot. What unique dessert ideas! My kids are old enough to customize and put together their own fruit spring rolls, and I think they would really enjoy doing that. I do love fruit and I do love spring rolls! What a great and fun idea. These would be a great hit at our house! Those fruit spring rolls look delicious! I’m absolutely going to have to try them! I thought the chutney was honey at first, but both seem like good options as a topping. Yum, especially for hot days! Oh, I love this sweet tooth satisfying alternative! This will be great to make for my whole family, and especially like that it is no bake! This is such a great way to use spring roll wrappers! I know my family will love this dessert especially since it’s been so humid. That looks so delicious! I love a nice, sweet treat, but I don’t love the calories of a ton of sugar. 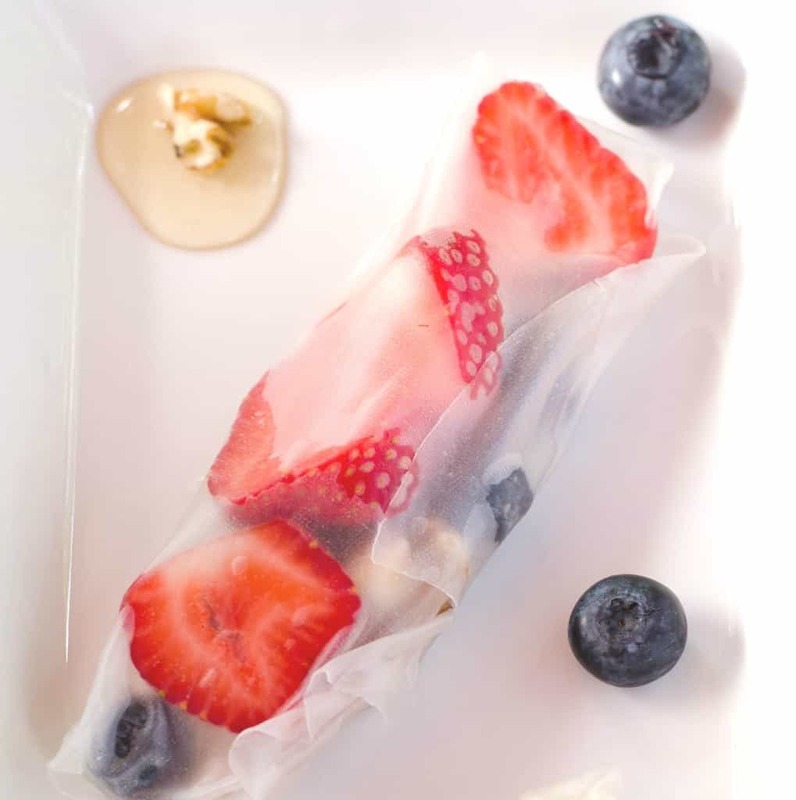 Fruit spring rolls are such a fun idea. I would love to make these. That looks so good! I have a terrible sweet tooth, and I’ve been trying to find something health to satisfy that. Thanks!